The New Jersey Devils have officially announced that Taylor Hall underwent arthroscopic knee surgery this week, and will begin rehab immediately. Hall’s recovery timeline has not been announced, as it depends on how he responds to rehab in the coming days and weeks. It’s not clear if Hall will be ready to play again this season, but at this point you couldn’t blame the Devils for shutting him down entirely. The team is well out of the playoff race and will be competing once again for the right to draft first overall in June. Hall’s presence would hurt those chances and while no team is actually hoping for losses, if there is any slight risk of re-injury there seems little point to risk his health. The reigning Hart Trophy winner went down to injury just before Christmas after scoring 37 pints in 33 games and hasn’t been able to get back into a game since. That means his season will likely finish as the lowest-scoring year of his career, and get him even closer to unrestricted free agency without anything to show for the Devils. Hall has just one season remaining on his current contract that carries a $6MM cap hit, which means he is eligible for an extension on July 1st. It’s not clear just how big of a raise he’ll be looking for, but after scoring 130 points in his last 99 games his average annual value could approach eight digits. When reigning MVP Taylor Hall was named an All-Star earlier this month despite being sidelined with a lower-body injury, it always looked like a long-shot that he would even be back in the New Jersey Devils’ lineup by All-Star weekend, nevertheless willing to participate in the exhibition event. That prediction has come to fruition, as Hall has officially backed out of All-Star participation. Fortunately, the Devils will be well-represented anyway. Kyle Palmieri, enjoying a career season, has been named Hall’s replacement on the Metropolitan Division squad, New Jersey announced. Palmieri, 27, is making his first All-Star appearance in his ninth NHL season. It also happens to be the best season of his career to date. Palmieri has already registered 22 goals and 38 points in 47 games, putting him on pace for 38 goals and 66 points, both of which would shatter his previous career highs. Palmieri leads the Devils in goals, points, power play production, and shots in what has been an offensively dominant campaign. More than any season before, Palmieri deserves the All-Star nod and will be a fitting addition to the festivities. 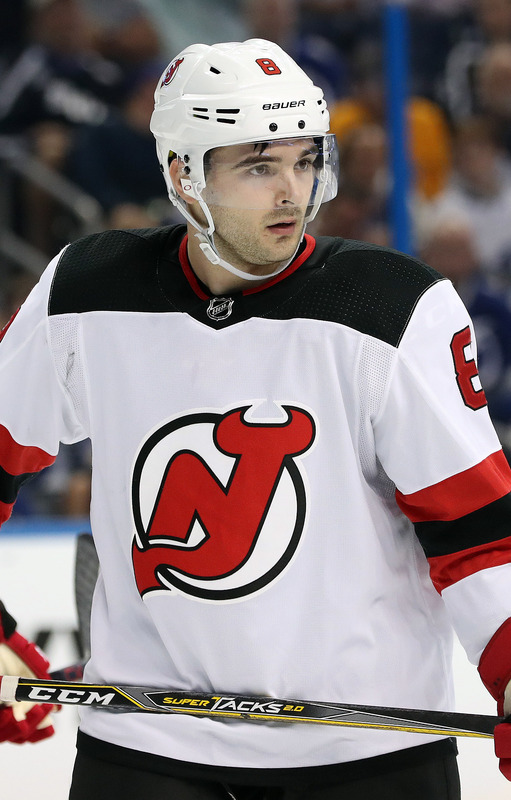 Palmieri’s success – and now league-wide recognition – is also why he is considered an untouchable asset for the struggling Devils. New Jersey has fallen short of expectations this season just one year after a surprise run to the postseason, but Palmieri has been one of the lone highlights. Although his trade value has never been higher, the Devils are reportedly not willing to consider offers in the days leading up to the NHL Trade Deadline that revolve around Palmieri, who has two years remaining on his contract at a bargain $4.65MM if he keeps up this level of production. Many other pieces could be moved by New Jersey in the coming weeks, but their 2019 All-Star is here to stay. The New Jersey Devils announced that they have placed Hart Trophy winner Taylor Hall on injured reserve with a lower-body injury, retroactive to Dec. 23, meaning the forward can be activated at any time. While Hall still leads the Devils in points scored, he isn’t having the immense season he had a season ago when he accumulated 39 goals and 93 points. Through 33 games, Hall has 11 goals and 37 points. He wasn’t even missed much in the past three games as the team won all three on the strong goaltending of rookie MacKenzie Blackwood. Hall last played on Dec. 23 and has since missed three games with that lower-body injury. NJ.com’s Chris Ryan writes that even though he can be activated at any time, he did not accompany the team on their four-game roadtrip that starts Wednesday in Dallas. However, Hall could meet up with the team when he is ready to return to action. In the meantime, the Devils have recalled defenseman Egor Yakovlev and forward Blake Pietila from the Binghamton Devils of the AHL, to join the team on the roadtrip. The 27-year-old Yakovlev has already played 11 games for New Jersey, posting four points. A free-agent signing out of the KHL this summer, Yakovlev has provided solid insurance depth for the franchise. The 25-year-old Pietila has not made an appearance with New Jersey this season, but has appeared in 19 games over the last four years. He has been playing well with Binghamton with 12 goals and 22 points in 34 games. The NHL offseason usually revolves around the salary cap. Teams struggle to fit in as much talent as possible under a fixed ceiling, and are hindered in trade negotiations because of their limited cap space. The Edmonton Oilers for instance have done little this summer despite a desperate need to return to the playoffs, strangled by their expensive long-term contracts. Few teams in the league find themselves as unencumbered as the New Jersey Devils do currently, with less than $60MM in cap commitments for this season and only two players under contract for more than three years. Even with the most cap space in the league the Devils haven’t done much to improve their team this summer, instead deciding to take an extremely slow approach to developing a contender. Amazingly, it could pay off sooner than later. New Jersey returned to the playoffs last season on the back of a Hart Trophy-winning year from Taylor Hall and solid debuts from several of their young players. Will Butcher jumped from winning the Hobey Baker award as the best college player in the country to quarterbacking an NHL powerplay, and finished his rookie season with 44 points. That put him 20th in the league among defensemen, ahead of star players like Oliver Ekman-Larsson, Aaron Ekblad and Zach Werenski. While there are other flaws in Butcher’s game, the Devils used him perfectly in a role that was best suited to take advantage of his talents. Jesper Bratt started the year off on fire with 12 points in his first 13 games, and finished the year with a solid rookie total of 35 points. After turning 20 just a week ago, Bratt will be relied on as a key piece for years in New Jersey, despite his sixth-round draft pedigree. At the other end of the spectrum was Nico Hischier, who put up 52 points after being selected first overall and took over the team’s first-line center duty by the end of the year. The teenaged Hischier looks like he could be a Selke candidate in the future, along with having big offensive potential. While Hall has just two years remaining on his modest six-year, $36MM contract the team seems in no rush to surround him with expensive free agent talent in order to take advantage of his bargain price. Instead, seeing as they’re already a playoff-caliber team, they will wait for their internal talent to blossom before eventually sitting down with Hall for a long-term extension. Hischier, Bratt, Pavel Zacha and others will mature on the roster while prospects like John Quenneville, Michael McLeod, Ty Smith and Jesper Boqvist will fight to secure jobs on it. Unlike Edmonton, who is fighting to improve the roster without any flexibility, New Jersey finds themselves in a position to wait for the right moment. At the trade deadline last season, the Devils rewarded the solid play of their young team by adding Michael Grabner and Patrick Maroon for a playoff run. The team gave up relatively little in future assets—a pair of draft picks and two unsigned prospects—to try and make a bit more noise in the postseason. Though they wouldn’t find much success against the Tampa Bay Lightning, they would gain some good experience for the future. Even Hall, who will turn 27 this November, had never reached the postseason before last year. You can bet they will be interested in doing something similar should they find themselves in a playoff hunt again this year, given their ample cap space. The other consideration is the expected free agent class of 2019, which should include several (if not many) star-level players. GM Ray Shero already admitted that he pursued James van Riemsdyk this summer before the price got too high, but perhaps that threshold would raise when dealing with someone like Tyler Seguin or Artemi Panarin. Both are still scheduled to become unrestricted free agents next summer, along with names like Erik Karlsson, Mark Stone, Matt Duchene, Jordan Eberle, Jeff Skinner, Blake Wheeler, Joe Pavelski, Max Pacioretty, and dozens more. While many of those players will be re-signed before New Jersey ever gets a chance at them, they might find themselves in a situation where they can outbid basically any other team in the league for whoever is left.